Enter reference seperated by commas! Track your freight 24/7 with freight tracker! Please enter your reference number(s) separated by a comma. Excellence In Logistics: Customers conducting business with TM Express will experience a professional, courteous and respectful freight shipping experience, unparalleled to any other logistics company. We cordially invite you to experience “Excellence In Logistics” by joining our customers who continually have their expectations exceeded! Market-Leading Logistics Management System: To provide the best customer experience, TM Express has developed a custom logistics management system that allows customers to interact with TM Express in real time 24 hours a day, 7 days a week. 1. Carriage and other services performed hereunder are subject to these conditions and to the rates, rules and classifications set forth in the Carrier’s current effective tariffs which are available for inspection and incorporation into this contract. 2. As used in this contract “Carrier” means the TM Express and its authorized agents. 3. In tendering the shipment for carriage, the Shipper warrants that the goods herein are in apparent good order and packaged to protect the enclosed goods [except as noted (contents and conditions of content(s) unknown], for ordinary care in transportation. 4. All shipments may at the Carrier’s option be opened for inspection. 5. Carrier shall not be liable for special or consequential damages. 7. In the case of the loss or damage of part of the shipment, the limit of the Carrier’s liability will be calculated as follows: The average declared value per pound of the shipment multiplied by the number of pounds of that portion of the shipment which may have been lost or damaged, plus the amount of any transportation charges for which the Carrier has been paid for such portion of the shipment that may have been lost or damaged. The average value per pound of the shipment shall be determined by dividing the declared value of the shipment by the chargeable weight of the shipment. 8. The shipper and the Consigned shall be liable, jointly and severally, (a) for all unpaid charges payable on account of a shipment pursuant to this contract and (b)to pay or indemnify Carrier for all claims, fines, penalties, damages, legal expenses, costs or other sums which may be incurred by Carrier by reason of any violation of this contract or any other default of the Shipper or Consignee of their agents. 9. Carrier shall have lien on the shipment for all sums due and payable to the Carrier. 10. In the event of the failure or inability of the Consignee to take delivery of the shipment, Carrier will notify Shipper in writing at the address hereof and request disposition instructions. If the Shipper fails to provide disposition instruction within 3 days after the Carrier’s notice, Carrier will return shipment to the Shipper at the Shipper’s expense. If the Shipper fails to accept delivery of the return shipment, Carrier may upon 30 days written notice to the Shipper, dispose of the shipment at public or private sale and pay out the proceeds to satisfy the transportation charges owing on the shipment. Any sum collected by Carrier in excess of such transportation charges will be paid to the Shipper. No sale of disposal pursuant to this rule will discharge any liability or lien to any greater extent than the proceeds thereof. The Shipper and the Consignee shall remain liable, jointly and severally for deficiency. 11. Claims for a loss of damage discovered by the Consignee after delivery and after a clear receipt has been given to the Carrier must be reported in writing to Carrier within 3 days after the shipment with privilege to Carrier to inspect shipment, its container(s), and packing material within 7 days of such notice. 12. Claims for loss, damage or delay must be in writing within a period of 3 days after the date if acceptance of the shipment of the Carrier. 13. Claims for overcharges or duplicate billings must be made in writing within a period of 30 days after the date of acceptance of shipment by Carrier. 14. Carrier shall not be liable in any action unless a claim has been filed and such action is brought within one year after the date written notice is given to the claimant that Carrier has disallowed the claim in fill or part. 15. To the extent that is not governed by Federal Law, this Contract and the tariffs incorporated by reference shall be constructed and the performance of the transportation hereunder shall be determined in accordance with the laws of the state in which the shipment is accepted by the Carrier. If any provision of this contract including the tariffs incorporated by reference is determined to be invalid or unenforceable by law, the remainder of this contract shall not be affected thereby. 16. Carrier acts as self-insurer for liability amounts below one hundred dollars and maintains liability insurance in excess thereof. Carrier accepts no liability in excess of $100,000.00. 17. Shipper collects charges, collected by the Carrier on Shipper’s behalf, will be advanced only after a minimum of ten banking days after receipt by the Carrier. A Decade of Exceptional On-Time Performance: TM Express was founded in 1999 by Gene Pilgrim. As a veteran of Fortune 500 companies, Mr. Pilgrim identified the need for a nationwide logistics service that focused on providing the highest level of customer service and delivering shipments on time, every time. We offer a wide range of freight options at very competitive prices. Our services include warehousing, LTL, full truckload, and next day delivery to select locations. 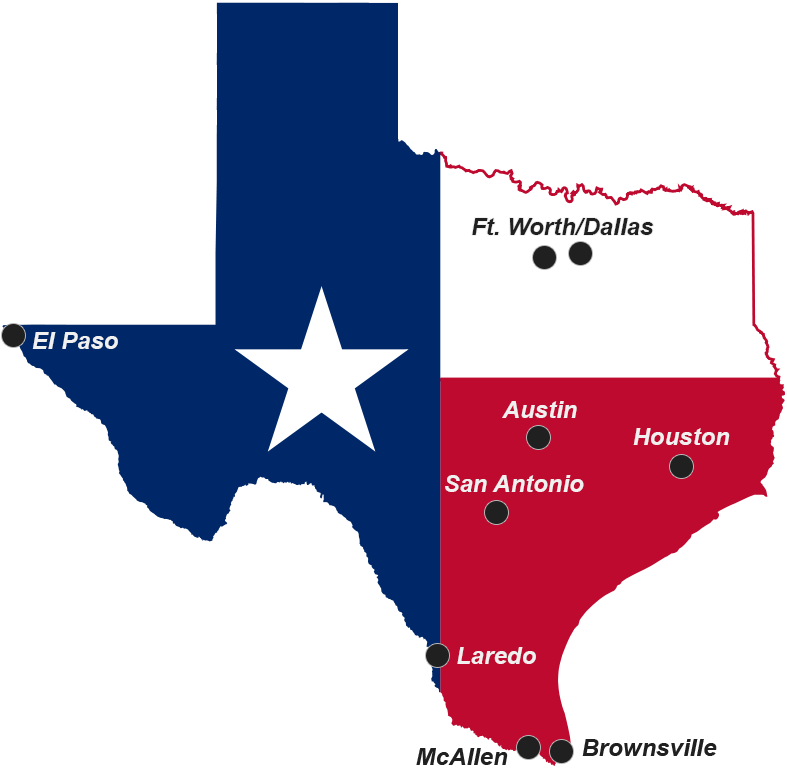 TM Express offers overnight LTL service to all major cities in Texas. We are U.S. Customs bonded and offer pickup and delivery. AM and by-noon delivery options available. Single or nonstop team delivery from any origin to any destination within the continental United States. UIIA affiliate drays containers from any port or railyard. De-van containers or deliver to consignee for live load/unload. LTL or truckload from any origin in us to major cities in mexico. Multiple carrier interchange agreements to expedite the delivery of your shipments. Large vehicle fleet ensures expedient service with four-hour service in Dallas, Austin, and McAllen. Trucks routed for repeated daily shipment distribution. Hot shots and urgent freight movements with 24-hour delivery service from any origin to any destination in the continental United States.. Secured warehouse available for short term, long term, or future shipment storage. Installation of kiosks, removal of debris, turnkey delivery of product displays, and asset recovery. We are looking for drivers who are reliable and experienced. Our services include warehousing, LTL, full truckload, and next day delivery to select locations. We expect the highest quality of customer service from our drivers. To join our team of drivers please meet the requirements and apply below!